It was a Commonwealth Games medal, just not the one the New Zealand team pursuit riders were after. 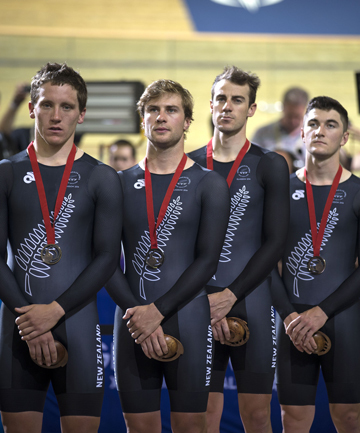 Bronze medallists at the world championship in February, the team of South Canterbury cyclists Dylan Kennett, Marc Ryan, Shane Archbold, and Piet Bulling, from Southland, had set their ambitions on a gold medal final in Glasgow. But faced with covering for a shoulder injury to regular teammate Aaron Gate, the game plan they'd worked so hard on in preparation crumbled like stale Weetix over the final stage of their qualifier. First Kennett failed to get back into the train after a big pull on the front, then Ryan fluffed his lines after more hard work on the front and the New Zealand team saw a handy lead over England turn into a deficit which consigned them to the ride for third place against a Canadian team 14sec slower in qualifying. A determined New Zealand team executed the same game plan perfectly in the medal round, running the Canadians down like startled hares by the halfway mark of the 4km race. Bulling was experiencing mixed emotions as he contemplated the bronze medal hanging around his neck. ''We definitely wanted to come away with a medal. The whole team was really gutted after this morning's ride. In training and leading into this we've all been better than we were this morning,'' he said. ''It fell to bits in that last five laps, which is a real shame. It's the first time we've raced with the format that we rode, a bit trial and error, but in training it was working well - but on race day it didn't work so well. Bulling said there was still some consolation in winning New Zealand's first medal of the Glasgow Games. ''It's a medal and it still means a lot to me. This is my first Comm Games and to come home with a medal is bloody awesome, but it's not what I've been training for and it's not what I wanted to come away with, I wanted to come away with a gold or silver,'' he said. For most of the riders, there are chances still to come. Ryan and Kennett will join Patrick Bevin in the individual pursuit tomorrow, while Kennett and Archbold will compete in the scratch race with Tom Scully and Archbold will back up in the points race with Gate and Scully.